Firstly, I discovered a series of videos has gone up on the net about what it's like to play in an orchestra (flutist Anna Pyne of the U.K.). What a summer holiday/rainy-day treat!! Then, as it was pouring with rain, over the course of today I began to make list of all the coolest links for flutists interested in the orchestral life, and please suggest more, and comment!! Is it raining? Are you on vacation? If so help yourself! 6. Trashy summer hammock read: Jilly Cooper's paperback novel: "Appasionata" Massively hilarious--you'll fall out of your hammock!!! 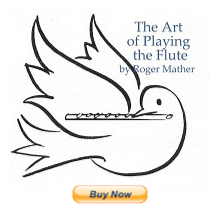 Other flute/musician books listed here. This is a fascinating website, Jennifer! The positioning together of thoughts about artistic, professional and personal experience is something on which all aspiring (and practising, professional) musicians should reflect. As a close bystander, I see the real issue - as I've tried to explain in my web article, which you kindly feature - as being that professional musicians have to start believing in their financial, as well as their artistic, worth. These two matters are not at all separate issues when it comes to professional orchestral life.... and at some point, often 'too late' for easy resolution, this realisation dawns for most serious musicians. The challenge now is to find ways of making the career of professional (classical / orchestral) musicians sustainable as just that, professional, for individuals over the longer term. Thankyou dearly, Hilary and Justin for visiting my blog and leaving your very very welcome comments. I think this whole topic is fascinating, and would love to continue it further. Readers, please visit www.justinlocke.com and www.hilaryburrage.com and read, muse, and comment. Love to talk more about flexible careers for well-trained musicians. It is so refreshing to read all about these people and their lives in the orchestra and realize that I am standing before a wide open gate, about to set out on an incredible journey which so many other musicians have already traveled. It's amazingly encouraging! Thank you so much for taking the time to collect and post all these fantastic links! I have had so many curiosities about life as an orchestral musician and I never feel as though I have enough time to discuss these topics with my teachers. Well huge thanks to you too, you guys who commented. Thank YOU! Wonderful to hear from you that these are helpful links.